It’s refreshing (if I can use that word in this context) to see activism use humour to get its message out. Check out more of Nina’s art at spacecoyote.com. Recently, Nina’s manga version of The Simpsons (posted at deviantart.com) caught the eye of Matt Groening, and she was asked to do the art for a Simpsons comic parodying the manga cartoon style. 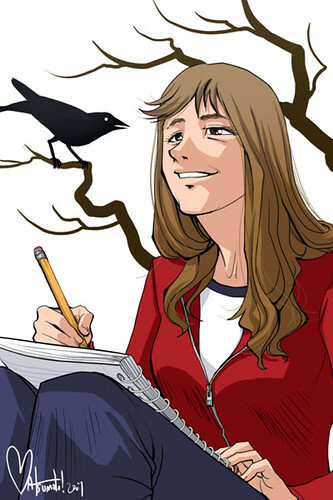 Her next project is a manga of her own creation. I’m lucky she managed to fit in my portrait commission. I don’t look much like a manga hero, but I still like it much better than my photographs! I like the way people in Japan celebrate cherry blossoms. Families and friends gather under the flowering trees to stroll, take photos, admire the blossoms and picnic (it is not all quiet and contemplation, though, as there is often a lot of alcohol and the occassional portable karaoke machine). 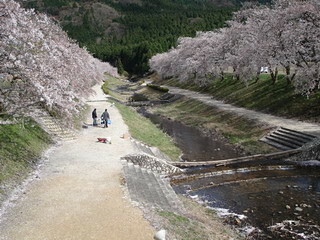 Cherry blossom viewing has its own term, hanami. A variation of hanami is yozakura, night-time viewing. 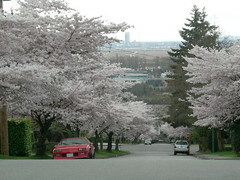 People hold parties under the trees at night, and many a haiku has been written about cherry blossoms in the moonlight. 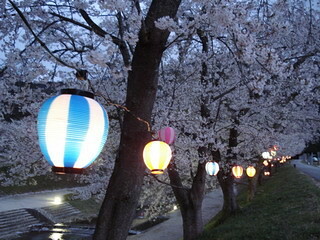 In the old days, lanterns and torches would have been added to shine light on the blossoms. Today, people bring portable generators to power spot lights. People eat, drink and talk and occassionally look up and comment on the beauty of the blossoms. The short lifespan of the flowers makes the occassion particularly special. Celebrating the blossoms here in Canada is mostly a solitary activity (though I’m happy to say, the Vancouver Cherry Blossom Festival is working to make it more a part of our culture — at least here in the lower mainland). For now, I celebrate by going for extra walks down streets lined with blossoming trees and paying visits to my favourite trees. It’s hard to hold a party under the blossoms when most of the flowering trees are along streets, but just standing under them is a party for the senses. Now, only four days later, it’s as warm as summer, and people are wearing shorts and t-shirts. It wont last, but I think it’s finally safe to say Good-bye Winter!